the book “Notes on Jaffna – Chronological, Historical, Biographical – From 1505 onwards” by John H. Martyn – a historian. And foster each heavenly germ. In 1834, after nearly 300 years when Ceylon was part of the Diocese of Cochin (India), His Holiness the Pope Gregory XVI established Ceylon as a separate Apostolic Vicariate. About 1839 when St Mary’s Catholic Church was being built, the Catholics of Jaffna petitioned the Holy See to send a few European priests. This resulted in a small band of Italian priests, of whom Fr. Bettachini was the first to arrive in 1843. In 1847, Dr. Mazenod, the founder of the Order of the Oblates of Mary Immaculate (OMI) sent another band consisting of Fr. Semaria at the request of (who was by then) Bishop Bettachini. 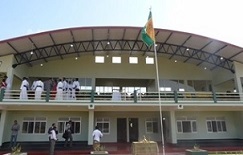 Thus, the beginnings of St. Patrick’s College, Jaffna, Sri Lanka is closely linked with the First Vicar Apostolic of Jaffna, the Rt. Rev. Dr. Horace Bettachini. 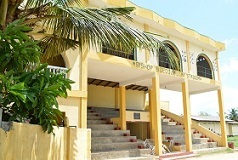 In 1850, the Jaffna Catholic English School was founded by Bishop Bettachini. Fr Mauroit was the first manager and Mr Patrick Foy, an Irish gentleman, was the first principal. The teachers were Mr William Marsh, Mr W. Santiagupillai, Mr G.S Ariyanayagam Pillai, Fr Xavier, Mr. MacDonnell, Mr. Paul & Mr. Veeravagu. In 1857, Rt Rev Dr John Stephen Semaria, Bishop of Olympia, succeeded Dr. Bettachini. In 1860, the Ceylon School Commission, after representations made by Fr Bonjean, gave an annual grant of one hundred and fifty pounds and also renamed the school, the Jaffna Boys Seminary. In 1861, Bishop Semaria went to Europe and returned with (among others) Brothers Conway and Dowling. With the appointment of Brother Conway as principal of the Boy’s seminary, a new era of progress began in the school with ten members of staff. Brother Conway managed the school for 8 years and died on 22 February 1870. Dr Bonjean who had succeeded Bishop Semaria as Vicar Apostolic of Jaffna took great interest in developing the Jaffna Boys seminary. In 1879, the Very Rev Fr Soulier, Visitor General of OMI came on a visit to Jaffna. Bishop Bonjean had left for France in 1879 for the General Chapter of the oblate congregation. 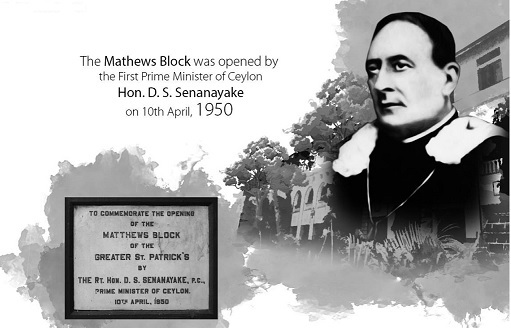 On his return to Jaffna in 1880, he decided to amalgamate the preparatory ecclesiastical seminary and the Jaffna Boys seminary under the title of St. Patrick’s College and applied to the Department of Public Instruction for registration of the College as a complete High school under the Revised code. 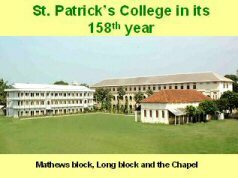 The College under its present name was opened on 10 January 1881 and Rev Fr J R Smythe was the first principal of St Patrick’s College. Rev Smythe was the son of a Protestant Clergyman and while a Police Magistrate of Jaffna, resolved to join the Catholic Church and was ordained on 8 December 1868. The foundation stone of the large College Hall, measuring 105 X 22 feet was laid on Sunday 4 December 1881. 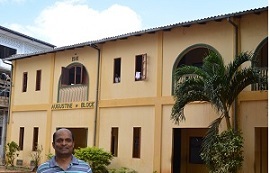 Rev Fr Patrick Dunne – who came to Jaffna as Br. Dunne in April 1885 – was the 5th Rector. 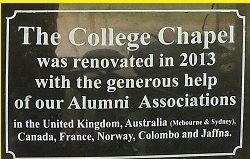 During his time, the College came to be regarded as the best in the island for its academic achievements. Rev. Fr Dunne found the time amid his duties as Principal to publish a system of shorthand he had invented for Tamil and in 1900, he published a concise Tamil – English Dictionary. Mr S Abraham who had been a student of the Jaffna Boys’ Seminary and had been appointed a teacher in the sixties, retired in May 1901. Maths was his favourite subject. In October 1901, Rev Fr Dunne retired after 16 years and went back to Europe. When the College decided to form Houses, it was decided to do so using the 1st 4 letters of the alphabet – Abraham, Bonjean, Conway & Dunne – named after the various luminaries in its establishment and development. Around 1951, Conway House was renamed Matthews House and later Abraham House gave way to Long House. Rev Fr C.S. Matthews joined the tutorial staff in 1905 and Rev Fr T M F Long joined the staff in 1920 and both subsequently became Rectors. The Matthews Long era from 1905 to l954 was the College’s golden era. 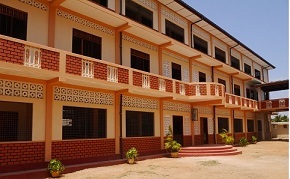 Fr Long was also instrumental and played a large part in the building of the Jaffna Library. In 1954 the missionary era came to an end and Rev. Fr. S.N. Arulnesan, a past student of the college became its first indigenous Rector (1954 to 1960). Rev Fr T.A.J.Mathuranayagam was the first diocesan priest to become the College’s Rector. The College had a total of 18 Oblate (OMI) priests and brothers as Rectors since its inception. 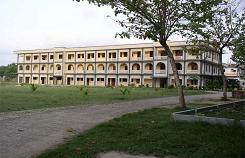 It is the main Catholic Educational Institution of the Diocese of Jaffna.